These Lifts, Mounts, Brackets and Stands are available in a wide variety of design types, shapes, sizes and capabilities. With the diversity of today’s modern television, movie projector and speaker technologies, it is important to find a company that has the experience to provide you with the perfect fit for your application. 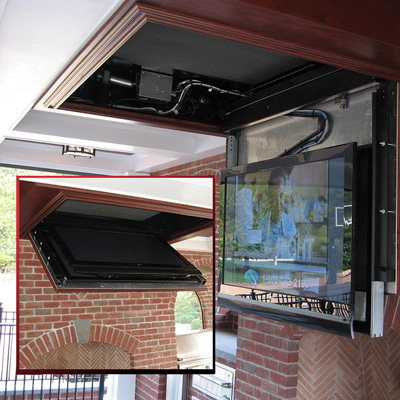 Your flat panel TV, movie projector or speakers descending from a concealed ceiling enclosure. Your flat panel TV automatically extending out from under your bed, rising up from the floor or from a beautifully hand crafted cabinet. Your flat panel TV projecting out from a finished cabinet or TV frame and rotating in a perfect line with your easy chair.